Ljubljana is certainly a city with a high quality of life. It is a city of greenery, its very centre occupied by parks and forests, and it also represents an ideal departure point for the discovery of all the variety Slovenia has to offer. Ljubljana demonstrated its uniqueness also by winning the prestigious European Green Capital Award for 2016. it offers everything a metropolis does yet preserves its small-town friendliness. You can find more on Ljubljana on pages such as Lonely Planet, The official Ljubljana tour guide, and many more. The best way to move around Ljubljana is by city bus. The map of bus routes can be accessed here. The bus fare can only be payed by the universal Urbana travel pass, which can be purchased and topped-up (buy credit) at kiosks and “URBANOMATS” found around Ljubljana. One of these Urbanomats can also be found in the immediate vicinity of main railway and bus station. 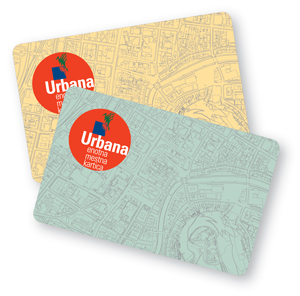 The Urbana card enables free-of-charge travel within a period of 90 minutes from the payment of the first journey, which costs 1.2 €. Please bear in mind that you cannot pay the fare or buy the bus ticket on the spot! More details on Urbana travel pass can be accessed here. In Ljubljana you can also use the services of many taxi companies. The starting rate is usually between 0.80-1.50 € with a per kilometre rate of 0.70-1.70 €, depending on the company, time of day and number of passengers. Waiting usually costs 15-20 € per hour. Ordering a taxi by phone will get you lower rates for longer distance trips. More detailed information on the public transport of Ljubljana can be found here. The WiFree Ljubljana wireless network allows visitors to Ljubljana city centre to use free wireless internet for up to 60 minutes a day. The holders of the Ljubljana Tourist Card can enjoy 24-hour free access to the WiFree Ljubljana network. Wireless internet access is available from the majority of hotels in Ljubljana, in most cases free of charge. Free wireless internet access is also offered by a large number of the city's cafés and bars. The roaming charges for European Union citizens may not exceed 35 cents per minute for calls made and 11 cents for calls received while abroad. The charges for European Union citizens sending SMS messages from abroad may not exceed 11 cents per message and no charges may be made for SMS messages received. The data transfer limit for European Union citizens using the mobile internet is set to €50. Once the limit is reached, the data transfer service is blocked unless another limit has been set by the user previously. Ljubljana is a city which can be proud of its clean drinking water. While rambling the streets of Ljubljana, you can quench your thirst for free at public drinking fountains, which operate from April to October. Shops in Ljubljana are mostly open between 8:00 AM and 7:00 PM during the week and from 8:00 AM to 1:00 PM on Saturdays. Lately, more and more shops are open also in the evenings and on Sundays. If you find yourself wandering hungry in Ljubljana there is no need for alarm, because the city has to offer a wide array of different restaurants (Italian, Chinese, Japanese, Brazilian, Serbian, Argentinean, Greek, etc.). For true gourmets, there are many places that serve excellent traditional Slovenian food, especially in the city centre. Extensive information about the Slovenian cuisine is also given at Lonely planet, Tripadvisor, Inyourpocket, and other. Throughout the year, Ljubljana bustles with the arts, ranging from simple street performers right through to grand opera performances, classical music recitals and summer festivals. Ljubljana's large student population fuels an eclectic and buzzing nightlife scene. In summer, people usually socialize on the Ljubljanica river banks. You can find more information on this topic at Tripadvisor, Ljubljanainfo, or Inyourpocket, for instance.